Before I get back on track with the Rum Keg and the scholarly research thereon, I wanted to touch upon the matter of the most famous drink named after the liquor + some containment unit. The Rum Barrel. Many places have many variations. Like the Navy Grog, this is one of those drinks that seems to beg bartenders to give it a personal spin. In reading up on the Don the Beachcomber version, the Steve Crane version, the Mai Kai version (This is one of the drinks in my heavy rotation when I visit.) and Jeff "Beachbum" Berry's "Bum Barrel" I decided to streamline and synthesize. 4 dashes Angostura (or beter yet, Tiki) bitters Blend with a cup of crushed ice in a spindle mixer or blender fitted with a milkshake blade. 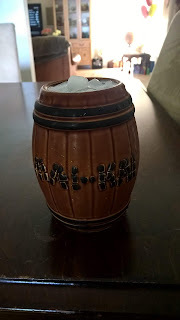 Pour half into your drinking vessel (a ceramic rum barrel or something suitably Tiki of the right capacity) add 1 oz club soda and then slowly (you want to keep as much of the effervescence of the club soda as possible) add the rest of the drink, with more additional ice to fill.